Introduction: Gena Philibert-Ortega is a genealogist and author of the book “From the Family Kitchen.” In this guest blog post, Gena shows how useful newspaper obituaries are for your family history research—and explains clues in obituaries that even some experienced genealogists might miss. Obituaries are the newspaper articles that most genealogists cut their research teeth on. Even so, many genealogists don’t get all the information they could out of an obituary, or recognize the clues an obituary can provide for additional family searches. Could there be more to obituary research for an ancestor’s death than just finding the necessary documents? My resounding answer is YES! As you look at your ancestor’s obituary consider some of the following research tips. When you conduct a genealogy obituary search, don’t stop at the death date, place, and the survivors. Analyze what is said that could point to other records or even additional articles. Of course there are, and can be mistakes in these documents but use your obituary research as a clue to other possible records. 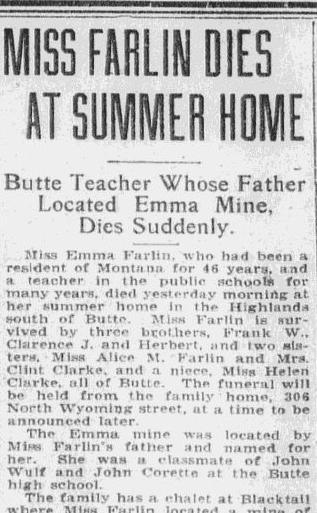 Take for instance this obituary for a Miss Emma Farlin from Butte, Montana. 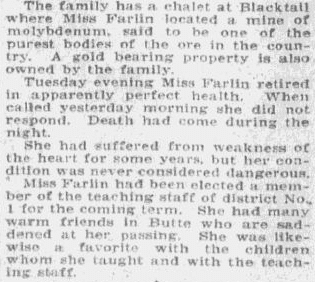 From this historical obituary you learn: she wasn’t married, her father founded a mine that he named after her, she was a teacher, where she taught, the names of six surviving relatives, the address of the family home where the funeral will be held, and the names of two of her classmates when she attended the Butte high school. After reading this obituary I would put together a genealogy research plan that includes looking for employment records, searching censuses and city directories for family members mentioned in the obituary, and looking for additional newspaper articles after her death that might include information about the children she taught. I would also be curious about the mention of the two men she went to high school with long ago—why were they mentioned in her obituary? I would want to research them further to ascertain their connection to her, and see if that research helps me learn more about Emma’s life. Although we automatically think of newspaper obituaries when we want to research an ancestor’s death, expand your search to include other types of newspaper articles that may also document an ancestor’s death. Not everyone had an obituary printed in the paper, but their name may be found in other newspaper articles such as a funeral notice, or a thank-you note from the family. Looking for a probate? Check the newspaper’s legal notices, those dense and small-typed notices found and often ignored at the end of the newspaper, for any probate notification. 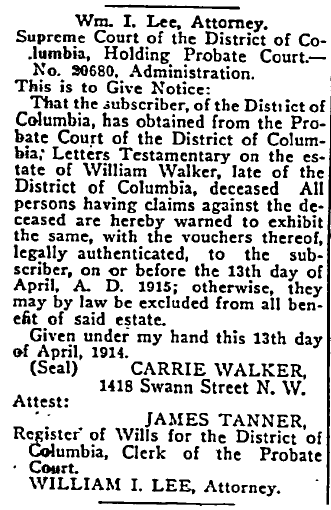 Here is an example of a probate notice, from a newspaper’s legal notices section. As you read your ancestor’s obituary, consider what other newspaper articles or official documents might have relevant genealogical information. In cases where a person died as a result of an accident or suspicious circumstances, a coroner’s inquest may be called and there may be court records available. 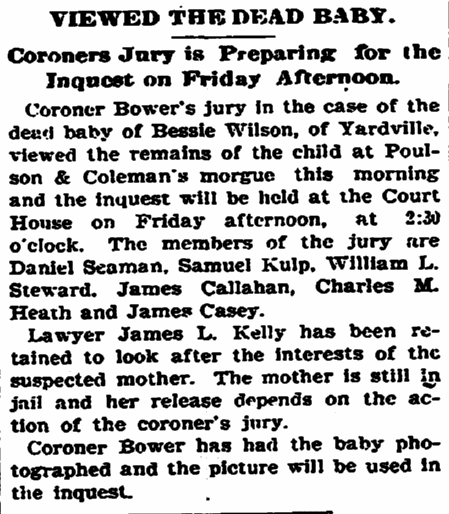 This newspaper article about the possible murder of a baby includes the names of the men serving on the inquest jury. In a situation like this tragic event, we can assume multiple articles about the suspicious death, and any justice served, were printed—and you’ll want to expand your search to track down all those articles. Remember when you research obituaries, finding your ancestor’s obituary is just the beginning, don’t stop there. Depending on whether your ancestor lived in a rural area or a big city, and the time period involved, you may be able to dig up much more than just information on the actual death. Consider searching the days or even weeks leading up to their death—in cases where there was a lingering illness or unusual circumstances, a series of articles may have been printed before your ancestor died. 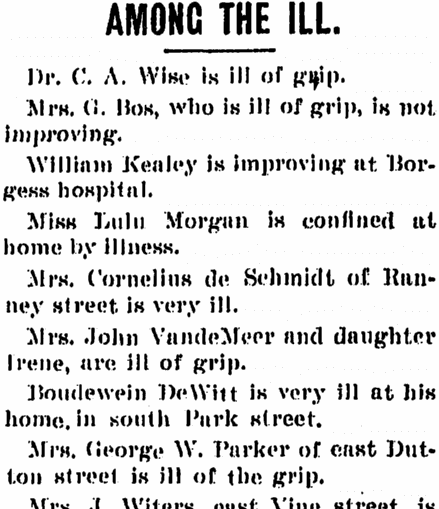 This old news article gives some great information about those who were sick, many of them from the grip (flu). Details including who was hospitalized, who is feeling better, who isn’t, and the inclusion of some street addresses make this a valuable article to family historians. There’s no doubt that searching for your ancestor’s newspaper obituary is a must for every genealogist. But remember that a death can lend itself to multiple articles—and that every article is a jumping-off place for additional genealogical obituary research. GenealogyBank in Top 10 of 2014 Best Genealogy Websites List! Your tips are great. Sometimes, we forget the trove of treasures we already have. Time to pull out my old clippings and go back through them! I think you’re right. We tend to do so much collecting of information that we forget that it’s a good idea to go back and reevaluate what we collected. I know I need to concentrate on that as well! Thanks so much for reading the post and taking the time to comment on it. Thank you for the excellent advice and examples. There was a big ‘clue’ in the obituary of my great-great-grandmother’s brother, John CAMPBELL, but the details of his line of descent from a Duke of Argyll did not quite make sense. We wrote to Clan Campbell Archives, who confirmed that there was a connection and gave us the correct genealogical data. Yours is a great example of following up on information found in the obituary. Thanks so much for sharing that. I check pallbearers…particularly if I’m missing marriages for women. I’ve found more than one husband using a pallbearers list. Great point Pam! Those lists are important. Great reminders and suggestions, Gena. Sometimes I forget that even though a descendant died in the mid 1800s there may have been a written account of that death. I have been searching for more information on the parents of a fellow that was scalped by Indians in 1865. There is a written account of that in a book an in a Texas Hood County Genealogical Association paper, but I have not looked for an obiturary or other death notices. Thanks for the nudge.